After active duty with the Marines for four years, Juan served 18 years with the Marine Corps Reserve. During that time, as Chief Warrant Officer, he held primary responsibilities in aviation logistics support, budget, training, deployment, and base facilities abroad. In the early 1990s he was in charge of deploying over 150 Marines and support requirements during Operations Desert Shield and Desert Storm. Juan became a trooper with the New York State Police in 1988, patrolling roads in Ulster County. 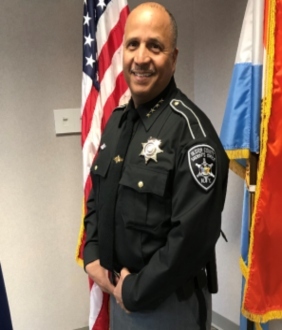 During his 25-year term with the State Police, he assumed key leadership roles initially as a Police Academy Instructor and Field Training Officer, then as an Investigator with the Bureau of Criminal Investigation for 19 years. Juan worked on several cases involving drug cartels. Investigations during his term resulted in the seizure of over $60 million in cash, 400+ kilos of drugs, and the arrest of key figures in the drug trade. Juan also was part of investigations relating to economic crime, corruption, racketeering, extortion, and identity and vehicle theft. Juan Figueroa has always been moved by a sense of service to people in his community and country. The son of Puerto Rican parents who immigrated to New York, Juan grew up in the Bronx with three of his siblings before the family moved to Plattekill, a hamlet upstate. Juan joined the US Marine Corps straight out of high school. Stationed in Japan, South Korea, and the Philippines, he took back with him important lessons in life: the importance of racial diversity and respect, regardless of personal differences. At his current position at a Fortune 500 company, Juan is responsible for planning facility security, asset protection, research, and internal investigations in the Northeast region. Juan trained with the DEA at John Jay College of Criminal Justice in New York on high intensity drug trafficking (HIDTA). He is HR-218 Certified, a Licensed Notary Public, and is bilingual. With a distinguished career as a veteran and five years in the corporate arena, Juan brings a broad perspective to law enforcement. He believes in upholding the law while working with the community and applying proactive, innovative, and sensible approaches to the county’s most pressing issues, such as the opioid epidemic. Juan represents a brand of leadership that values fairness, compassion, respect, and the highest standards of professionalism at all levels. After many years of public service, he remains bound by an unwavering sense of duty and deep commitment to the community.